Dominic Santiago is a vocal and practical Gear who's loyal to a fault, especially to his friends; he has no patience for those who think of themselves first. Dom has known Marcus Fenix since 12 B.E. when he was 7 and Marcus was 10. They fought together since the Pendulum Wars. Their personalities and temperaments match up well, providing a solid backbone for Delta Squad to lean on during brutal battles with the Locust. Dom has always believed in his country and his leaders, but his faith has been slipping in the face of this endless war. He lost his children on Emergence Day and his wife, Maria went missing four years later. For him, the fight against the Horde is deeply personal. In Gears of War 2, he finally finds Maria, but he kills her after he saw how badly the Locust tortured her. 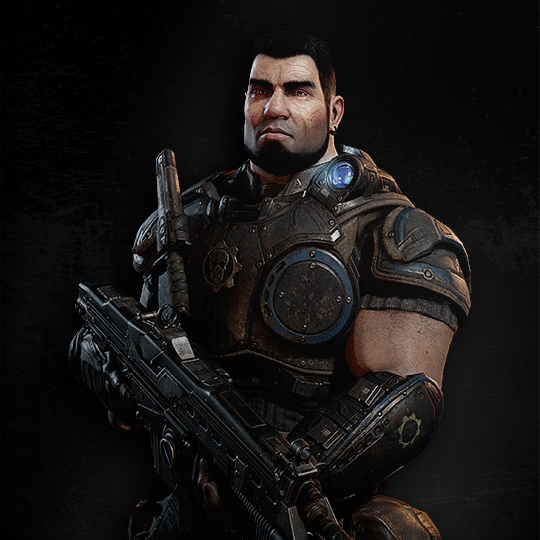 In Gears of War 3, he sacrifices himself to save Delta Squad.